Marco Rubio, pictured today in Andover, Minn.
Marco Rubio is almost certainly not going to come out of Super Tuesday a winner. This isn’t really in dispute, even by the people who work for him, who today explained to their most important funders that the Rubio campaign isn’t planning on winning any Super Tuesday states, or maybe even any states at all, ever. Several sources familiar with the meeting described it as an exercise in lowering expectations for how well Rubio needs to do in order to stay in the race for the White House. “The pressure is going to be so great in April and May, and they feel like they are committed to working in the trenches,” said one Rubio bundler who attended the meeting. The math isn’t going to be on Marco Rubio’s side tonight, so the best his campaign can do is set the bar so low that the campaign can’t help but step over it in their inexorable march forward. This was a strategy most recently employed by John Kasich in South Carolina, who joked that his campaign was expecting “maybe two or three votes” there. Haha! Rubio has been making this spin happen publicly. On Good Morning America after the Nevada caucus he said that candidates don’t even “have to start winning states” until March 15, which coincidentally, is when his home state of Florida will go to the polls. A skeptic may point out that Donald Trump is currently up something like 15 or 20 points in Florida. According to Palmer, Sullivan told his audiences this morning that Rubio will win Florida after he secures the endorsement of Jeb Bush, who is a person nobody likes. But even so, it still may not matter, as the Rubio campaign seems to be betting on the Republican party splintering away from Trump during a chaotic brokered convention in which Rubio, a zero-time winner, somehow emerges from the rubble with the American flag in hand. An anonymous source who spoke to Palmer all but confirmed that strategy, even if he or she didn’t sound all that convinced. 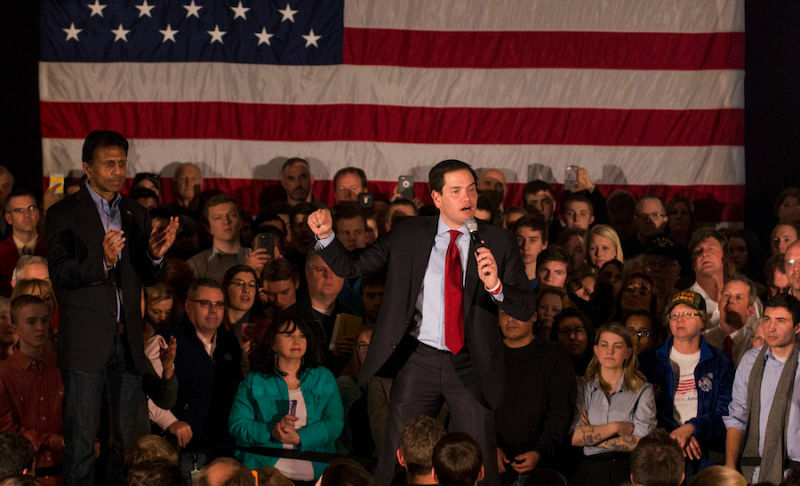 Marco Rubio is not going to be president.